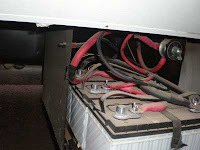 What is the best thing for RV batteries during the winter? I have a new motorhome and this will be its first winter. Should I leave the batteries in and keep the coach plugged in or should I take them out and store them for the winter? How about the engine battery? Some people take them out, some people leave them in. Which is best? If I take them out should they be charged once in a while? Gary, it is always recommended to completely remove all the batteries during a really harsh winter. Fully charge them before storing them in a clean, dry location in a warmer shed or garage. A fully charged battery will freeze only if the temperature dips to 55 or 60-degrees below zero, while a discharged battery may freeze at or near 20-degrees above zero. But it’s still best to remove them from the RV and avoid freezing temperatures when possible. There is probably no need to apply a charge during the actual storage period, but fully charge them just prior to re-installing them in the spring. 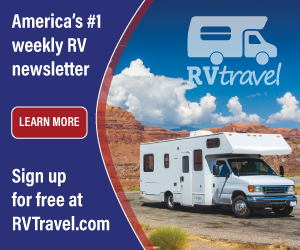 It is only advisable to leave the RV plugged in during the storage period if the coach is equipped with a computer-controlled, three-phase battery charger; one that monitors and adjusts the charging voltage and current accordingly. Otherwise, there is a great risk of overcharging the batteries and/or boiling out the electrolyte.